Do more of the things you love, without worries, thanks to the Accu-Chek Combo insulin pump system. The Accu-Chek Combo insulin pump system couples a handset with an insulin pump to bring you a level of freedom that fits your lifestyle better. It’s completely discreet, customisable to your needs and simple to use - and it fits in the palm of your hand. Interactive two-way communication - information flows between the handset and the insulin pump automatically or on command, as appropriate. Two-way Bluetooth® communication between the insulin pump and handset - with the Accu-Chek Aviva Combo handset, you have full remote control over pump functionality, you can quickly and discreetly deliver a bolus, and you have full visibility of pump status and activity. All of this is available on one device, in the palm of your hand so there is no need to touch the pump. Built-in bolus advisor on the Accu-Chek Aviva Combo handset - Quick, easy and discreet bolus delivery with assistance from a fully customisable bolus advisor. 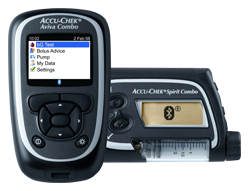 Data transfer option - with the Accu-Chek 360° software. Flexibility of data transfer to a computer fits your needs, capabilities and requirements. Preset and customisable reminders, warnings and error messages for glucose level excursions, blockages in tubing and more - to support you in managing your daily pump therapy. Full-colour display - with a colour display, graph clarity is enhanced and key items are highlighted. Integrated bolus advisor - straightforward and intuitive bolus advice from blood glucose measurement to insulin delivery. Customisable reminders - you can set reminders for infusion set changes, doctor and lab visits, retesting after meals and out-of-range blood glucose readings. Confidence - you don’t have to keep track of everything in your head, by programming reminders into the system. Tactile buttons - allow for confident and discreet bolus delivery even when the handset is not available. The pump can be operated from under clothing using the buttons. 315 U insulin reservoir capacity - convenient, easy-to-fill cartridge saves time with less frequent reservoir filling. A small hourly basal rate (0.05 U/hr) - delivered in small pulses over the entire hour. Minimum = 0.05 U/h, maximum. = 50 U/h. There are 24 hourly basal rates, adjustable in unit increments of 0.01 (up to 1.00 U/h), 0.05 (up to 10.0 U/h) and 0.1 (up to 50.0 U/h). Temporary basal rate: Adjustable in 10% increments, 0%–90% (decreases), 110%–500% (increases). The duration is adjustable in 15-minute intervals, up to a maximum of 12 hours. The last programmed duration is given by default for the next temporary basal rate change programmed. Flow (delivery rate): During infusion-set priming and bolus: 0.2 U/sec. Power supply: 1 1.5-volt AA alkaline (LR6) or lithium (FR6) battery or 1 1.2-volt rechargeable NiMH AA (HR6) battery. Batteries should have a minimum capacity of 2500 mAh. Use only a battery charger officially recommended by the battery manufacturer. Data storage time: The time and date are safely stored in the memory for about 1 hour after the battery has been removed. Other insulin pump settings (the hourly basal rates, remaining cartridge content, bolus increments and active user menu) and the event memory (bolus history, history of daily insulin totals, temporary basal rate history, and alarm history) are saved, regardless of battery voltage and the time your insulin pump has been without a battery. Cartridges: Accu-Chek Spirit 3.15 ml cartridge system and Accu-Chek 3.15 ml plastic cartridge with a luer-lock connection. Insuman cartridges*** have been evaluated and approved for use with the Accu-Chek Spirit Combo insulin pump. Safety systems: Alert system, beeps, information on the display, vibrations, and dual microprocessors. The insulin pump is controlled by two microprocessors. The safety concept is based on one processor (supervisor processor) supervising the other (main processor). Whenever a defect or fault occurs in the main processor, it is identified by the supervisor processor. The motor is immediately switched off and an “Error E7: ELECTRONIC ERROR” occurs. Conversely, the main processor can also determine at any time whether the supervisor is working correctly. The motor also constitutes an important safety component, as the combination of the main and supervisor processor and brushless motor provides the best possible reliability and accuracy in insulin delivery. *** INSUMAN INFUSAT is a registered trademark of Sanofi S.A.
A variety of cases and accessories to help carry your pump, including cases designed to help carry the insulin pump during sport activities to discreet pouches to help hide the insulin pump under clothing. To purchase any of the items shown, please contact the Pump Careline. This carry case has a trendy candy pink look, with a magnetic closure and belt loop on the back. This carry case comes in a timeless blue jeans design. Made of denim, with a press button closure and a belt loop on the back. Turn your child's insulin pump into their best friend! This carry case is made of neoprene, with a magnetic closure and a belt loop on the back. A case that offers added protection without adding bulk. Cannot be attached to a belt or strap. An elegant pouch made of top-quality black leather, with a clip on the back. For comfortably and discreetly wearing the pump on a belt or waistband. Made of high-grade leather with belt loop on the back to wear it on your belt. Ideal for playing sports. Made of rigid, fast-drying material, it is available in blue, black or white. Can be attached to a belt or strap. Made of soft suede like material, this case has a cord and a belt loop on the back allowing you to wear the pump around your neck, on your belt or on a strap under clothing. Available in blue, black or white. An elastic belt with snap closure, specially developed for combining with the neoprene pouch. 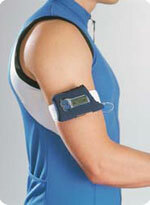 Elastic strap for attaching insulin pump cases around the waist (long) or upper arm (short). Velcro fasteners allow flexible adjustment. Download user manuals and access online training here. Already an Accu-Chek Combo owner? Register your insulin pump here.